As the host country for the 2010 FIFA World Cup, it only made sense that I start the series of 32 consecutive blog posts with some of the traditional bites and boozes of South Africa. I've found one local food item and one customary drink to highlight as Bite and Booze scans the globe for educational, cultural, entertainment, and indulgent purposes. Today, our menu consists of Bokkems and Pinotage! Bokkems are fish that have been salted and wind-dried by the crisp South African air. Typically the fish are either mullet or horse mackerel. 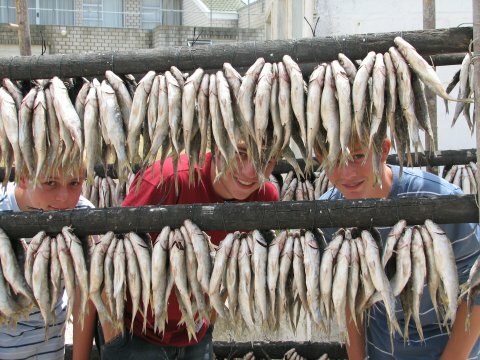 These fish, and bokkems in general, form an important part of the traditional cuisine in the cape, particularly along the west coast. The freshly caught fish are liberally salted with sea salt and left overnight in a cool spot to cure them. 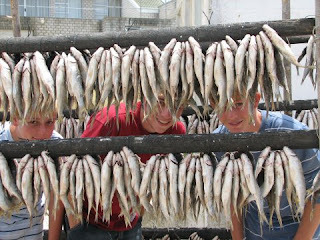 The next day the fish are taken from the salt, lightly rinsed, tied in bunches with twine threaded through the heads, and hung outside to dry in a cool spot with adequate air circulation. When dried and crisp enough for your liking they can be eaten as a snack food just as they are. 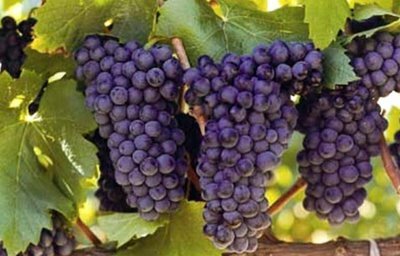 The Pinotage grape varietal is a cross between the Pinot Noir and Cinsault Grapes and is one of the classic grapes South African Wine. 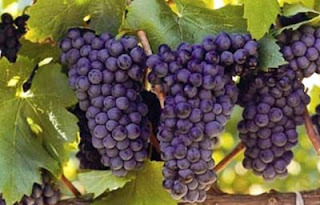 Pinotage is a versatile red grape variety which can produce an absolute top quality full-bodied food wine, or medium-bodied wine to be enjoyed on its own, or rosé wine or sparkling wine. The grape produces very enjoyable red wine that I've been fortunate enough to try and would love to drink a whole lot more of! Make sure to check out the BR Beer Scene for a little info on South African beer! There are some other SA treats one can find in town; World market carries Mrs Ball's Chutney (which is a South African fave). Although one can't find these in local shops (Baton Rouge), for a real taste of SA, you can find boerewors (sausage) and biltong (a cured meat, like jerky) online. Another popular drink is a beer shandy (beer mixed with carbonated lemonade - or in the US with Sprite/7-UP). Thanks for the info Robin!! Always good to know where to find some good international treats around BR. I thought about doing boerewors instead of bokkems, but I've got other forms of sausage coming up soon!